What is the Aranwa at Sacred Valley really like? We stayed at the Aranwa Sacred Valley as part of our 10 day Peru trip back in mid-July 2014. 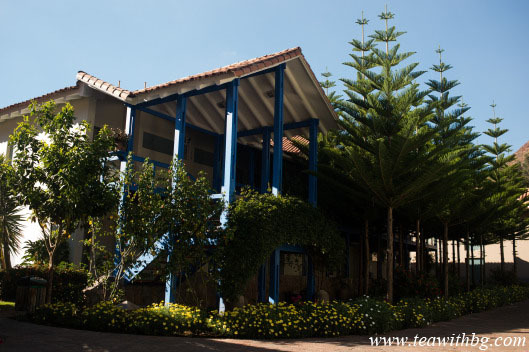 It was first recommended to us by our tour operator as a place to stay while we were at Sacred Valley. After much research on Tripadvisor, my top choice was actually the Tambo Del Inka (it came highly recommended by a friend and it is a Starwood!). But when we found out the price difference, we figured we will just stick with the Aranwa. It doesn’t look that bad -and we were right. While it was decidedly not a 5* luxury hotel (as they try to advertise it as), for that area it was comfortable and made for a pleasant stay. The grounds kind of reminded me of an upscale school camp site. Definitely a solid 4*. It is only 2800m above sea level (vs. 3400m in Cusco), which makes it an excellent place for tourists to acclimatize to the high altitudes. 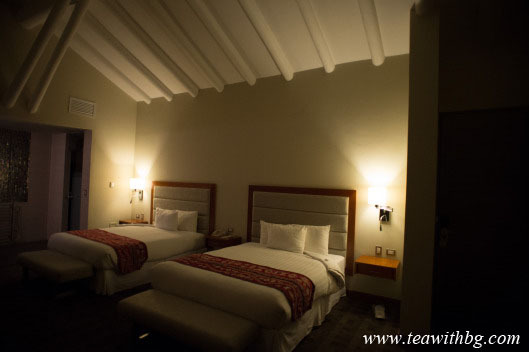 It is ideally located within a hour or so of key attractions in the region including Morays, Ollantaytambo, Pisac Market etc. To be specific, it is only about 1 hour or so to Morays and Pisac, and 20 minutes to Ollantaytambo. And from Ollantaytambo, it is only another hour or so train ride to Aguas Caliente (the base town of Machu Picchu). In comparison, on our way back from Machu Picchu to Cusco it was 4+ hour by train and another 20 minute ride back to the city. 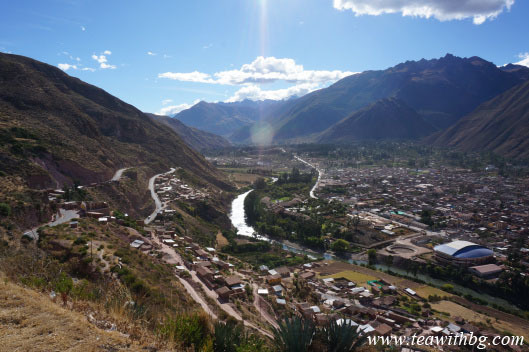 We didn’t exactly spend any time exploring the town of Urubamba, but besides some hidden gems of restaurants which served pretty decent food behind some very unsuspecting facades, there did not seem to be much to write home about. As many people have commented on, the hotel is welcome sight after a long journey there. But that is just because of the sharp contrast between what is outside the gates (absolutely nothing) and behind it. The entrance and the lobby are actually quite basic and a frankly a bit dated. For example, we suspect that the circular thing on the driveway was once a fountain (perhaps it was just turned off because it is dry season?). On the bright side, there is coca tea in the lobby, and the check-in process was relatively smooth. The centerpiece of the hotel is most definitely the grounds. It is beautifully landscaped centered around an authentically ancient church (it definitely smelt old!) 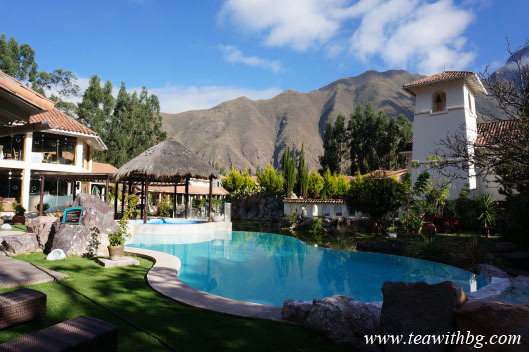 surrounded by a pond/pool (and the Andes mountains on either side! ), with 3 llamas and a couple of peacocks running around paths lined with gorgeous flowers. The outdoor pool and jacuzzi is one of the best places to enjoy the view. Too bad it was too cold to swim when we went. The jacuzzi is heated for those brave souls who want to test the Andes winter and enjoy the view. There is even a fully functioning horse carriage to complete the picture. Definitely take the time to explore and enjoy the grounds. For photographers, the best light is in the morning. It is actually somewhat gloomy in the afternoon as the sunlight is blocked by the mountains. a spa, though we did not try it out since the prices were US like! an indoor orchid garden behind the museum which was even less impressive – where were the orchids? a library, which was actually really cool, as it comes complete with excellent wifi, a warm sitting area and a mini cinema. This turned out to be an excellent place to watch the World Cup with a bottle of Peruvian beer! The hotel also claim to have free activities like fishing on the river, which we thought was really cool. But when we asked about it, the reception didn’t seem to know what we were talking about, and on further inquiry claimed that the fishing equipment was broken….. if it is broken, don’t advertise it! Because the hotel is so isolated, unless you are driving, be prepared to eat many meals here. In general, we thought the food was decent. Since breakfast was included, and our tour guide suggested that we take a light dinner in order to adjust to the altitude (and our lunch was so huge), we didn’t eat much and dinner wasn’t too expensive. On average I would say it is around US$10-20/head. Breakfast: While the buffet-style spread looked extensive, I personally only found a few things I wanted to eat (I’m a very picky eater). My go-to was the toast and the egg station (egg stations are the best!). The meat both cold and warm frankly did not look that appetizing. Dinner at the bar: The bar actually serves food from both room service and the main dining room, offering a variety of local and international cuisine (so if you are like me, you can enjoy pasta and a club sandwich). For our first night, the concierge somehow suggested we go to the bar. So we did. And while there wasn’t that many people there, it took our food 1 hour to reach us!! And this is only after we complained and threatened to leave (this was our first night, and after days of travelling we just wanted to go to bed)!! Over all the food was decent, though I would say that my chicken soup did contain way too much MSG. Main dining room: The service at the restaurant was much better. And we enjoyed a good meal there. Room service: The service was surprisingly quick, and the food when it arrived was still piping hot. The Aranwa is horizontally spread out, with a lot of outdoor space. Good thing it never rained when we were there. Hotel rooms are located in 2 storey blocks, a couple of minutes walk from the main buildings. As I mentioned, an upscale school camp. Our Deluxe Rooms were on the second floor and are supposedly already more modern than the regular rooms. But to be honest it was still very dated. The rooms are very spacious, lots of space to put suitcases and move around etc. If you don’t close your door fast enough, lots of little flies will come in. But they don’t bite and are very slow moving. I killed over 10 of them hovering over my bedside lamp. Not exactly their fault, but its winter. You’d think that they can grow some sort of plants to deter these insects. Wifi reception was poor, good thing we had 3G! The shower was weak, and the tub took almost a hour to fill up. The bath area was also freezing! The hotel provided products… let’s just say it’s a good thing I always carry my own products. Oh and most importantly, they are EXTREMELY STINGY about bottled water. 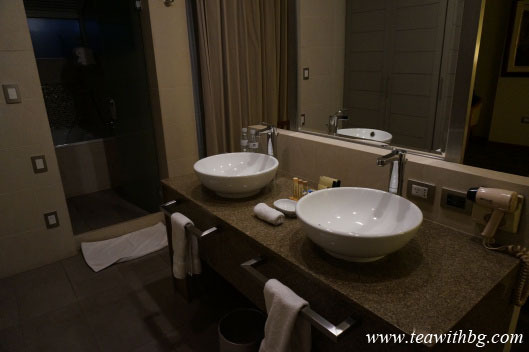 Each room is only provided 2 complimentary bottles per night. You can’t drink tap water in Peru. They charge you an arm and a leg for bottled water at the restaurant. The hotel is in the middle of nowhere. BRING WATER! Taking everything into account, despite its age and little kinks, we think that the Aranwa Sacred Valley is a solid 4* hotel. 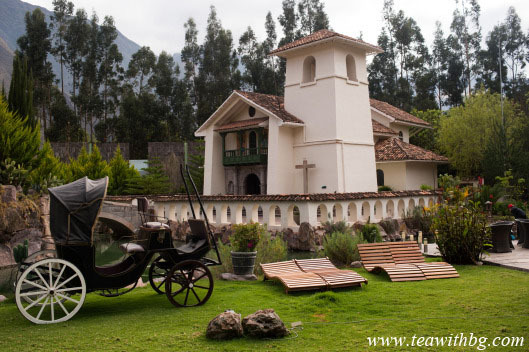 It could definitely use a renovation, but regardless, it makes for a decent place to stay if you are looking for somewhere in Sacred Valley with a mid-range price tag.